The exams are over and I've been hacking a bit on the Arduino today. 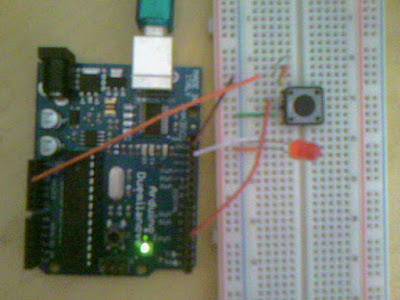 So I came up with a simple hack which blinks an LED on the Arduino if you've got unread mails in your Gmail inbox. I assume that you're familiar with the basics of Arduino. A python script will run continuously on the computer, and fetch the Gmail RSS feed every few minutes. pySerial will be used to notify the Arduino of new mails. Next lets get the count. Gmail replies in the following format. In the case of new mails there is more information, but we don't care about that. We're mainly interested in fullcount. So we'll use regular expressions to get the count. We'll need to write this to the serial port. The LED is on pin 13 and goes to ground. The button takes 5V through the power pins on the analog side, via a 220 ohm resistor. The other leg is grounded. Pin 4 can be used to read the state of the button. The wire from pin 4 connects to the 5V leg of the button. The code is dead simple and so is presented together. // or we had got serial input and button hasn't been pressed yet. The button is used to switch off the blinking once you've noticed that you've got mail and don't want it to keep blinking till the next check. Verify and Upload the code to the Arduino. You can try entering numbers in the Serial Monitor to check that the circuit works. Remember to switch off the Serial Monitor. Now start your script, python mailarduino.py. Enter authentication details. Now sit back and relax... oh wait, you've got mail.